Harvil, 1 Indoor is a ping pong table suitable for dens, offices or game rooms. Its sturdy construction, playability, and versatility make it a game table to consider. It is also a folding table you can buy for your family to have fun. Despite being a middle range table, it has exceptional selling features and meets many people’s expectations. Below is a detailed review of the table. When you purchase this table, you get almost all the accessories required. The package includes a white strip, 2 metal posts, and black net. The balls and rackets are purchased separately. However, they are available and cheap. The table gives you value for your money. The Harvil I, Indoor table is appropriate for a single, double or family game. For skilled players, it is suitable for training because of it playing back mode. The folding table is easy to store and transport. Though it is not fit for professional matches, the table’s top has a powder-coated steel frame that enhances its durability. The playing surface is 16mm thick. The legs can be adjusted to shield your floor from scratches. Also, it is a two piece table easy to fold and store. It does not consume extra space. The MDF top provides consistent ball bounces. Besides a sturdy construction, the aluminum coated top surface is protected from dents especially when shifting the table. With 8 locking wheels, 4 pairs on each side of the table, it is portable. You do not need a permanent setup. Also, it is light and can be folded and moved around. It weighs 150 pounds, making storage simple. Though its lightweight is prone to warping during play, the table still meets its expectations of instilling fun to families. It measures 61.5 inches in length, 23.6 inches in width and 63.5 inches in height. This dimension is vital as it not only reduces storage space but also the table occupies less area when it is set up. It has an attractive blue color that makes it beautiful. The playing surface is 16mm thin. It offers a slow play and bounce than standard tables that measure at least 19mm. Though it is not a competition table, the thickness is essential in having a decent ball bounce. However, the design of Harvil I, Indoor table is not for competition. It is valuable for training or having fun. In this case, the 16mm surface works fine. 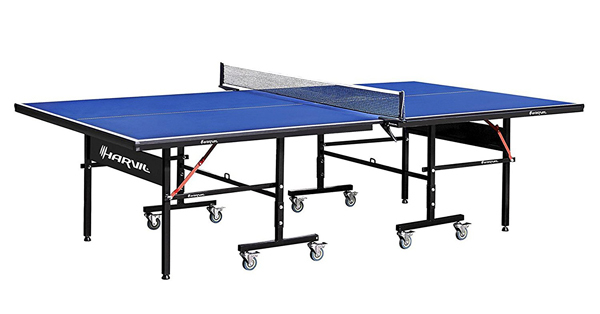 Harvil I, Indoor Table Tennis Table is one of the most convenient, affordable, portable and storable tables in the market. It is perfect for indoor playing. You can get it for your kids or the entire family to have fun. If you a skilled player, it will also help you in training. Though it is light and its top is thin, reviews from users show that it is a befitting table easy to assemble and play.